Do you want to know what peoples views are on the issue of the day, do you want to ask peoples views on a new product, perhaps you are carrying out a straw poll or do you want to collect data to input into a scientific model? All you need is SurveyMapper.com. If you have used other ‘polling sites’ then you will be up to speed, except we have taken away the restrictions and added real-time mapping into the mix. 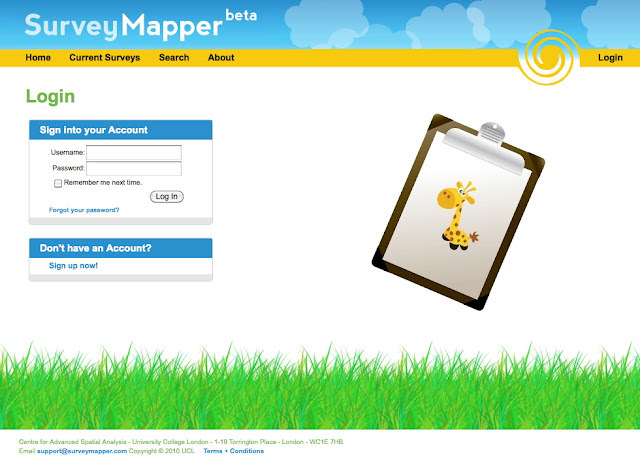 Simply sign up (its free) and then your be able to create your own survey and embed it into your own site. Currently we have five levels of survey available – Worldwide, based on countries, European Countries US Zip Code, UK Postcode and a Drag and Drop Pin Map. You can ask anything, survey the nation, the world or just your street with real-time mapping and statistics. Keep up with the SurveyMapper twitter feed for news on the beta release, new features such as blog embedding and integration with our now infamous Tweet-o-Meter and New Cityscapes via Twitter Maps. You can of course also follow us direct on Twitter @digitalurban.